How did 2 HH Sh Mohammed bin Rashid Al Maktoum know how fast to go to win the FEI World Endurance Championships at Euston Park yesterday (25th August 2012)? Having ridden around similar courses in competitions run from Euston Park in the past 3-4 years would definitely have helped. Although the course would not have been exactly the same as any used previously, there are a limited number of tracks that could be used. The fact that the area is essentially flat means that the time should be similar to 160km courses used before. Another factor that of course need to be considered would be the environmental conditions. The hotter, more humid, less cloud and less wind there is, the slower the speed. Watching what other riders do is also a factor that needs to be considered when setting out a strategy. You need to be up with the front runners to stand a chance of winning, but running with the front runners increases your chance of elimination. No two endurance races will be run exactly the same, but if you don’t like leaving things to chance and like statistics and numbers, then looking back at previous times for 160km races rides at Euston Park would seem obvious. And I suspect that this is what many teams would have done in their preparation for the 2012 FEI World Endurance Championships this weekend. But, even the strong evidence of previous times for 160km race rides at Euston as an indicator of race strategy would not give the whole picture. The missing factor? This was a World Championship, and they don’t necessarily have to follow the rules. In a World Championship you have a very high number of horses and riders, and a larger proportion of these than normal would be in with a chance of winning. This usually means that speeds would be expected to be a little faster than normal for such a course. The difficulty we have with endurance is that due to the distances involved, environmental conditions, going (footing), terrain and technical difficulty (e.g. number and frequency of turns) all have a major impact on the speed a 160km can be won at. So what should we have expected from previous 160km race rides at Euston Park over the past 3 seasons and how did this match up to the race pattern and winning speed for the Longines FEI World Endurance Championships 2012? The ride data for 2010, 2011 and 2012 for 160km senior rides at Euston Park was analysed. Each Summer for the past three years the rides have been held regularly and over similar terrain. So the first question I had is “have the 160km race rides at Euston Park (4 in 2010, 4 in 2011 and 3 in 2012 [there was a 4th 160km race ride in 2012 but it was slow by Euston Park normal standards, only had 4 starters and 2 finishers and so I decided not to include it]) been getting faster over the past 3 seasons?”. The answer to this one is a simple “no”. The fastest time for a 160km at Euston Park over the past 3 years was on the 25th July 2010 (22.2 kmh), followed by 21.6 kmh on 9th June 2010. That said, the last two race rides this season at Euston before the Longines FEI World Endurance Championships both posted winning speeds of 21.3 kmh! So over the past 3 seasons at Euston, the average winning speed for 11, 160km race rides was 20.8 kmh, with the fastest being 22.2kmh and the slowest being 18.9kmh. Thus, with “normal” August conditions this weekend and with good going (i.e. not too soft), I would have to be expecting the winner to complete in a time of 22.2kmh + a little extra to allow for the fact that this is a championship. In fact, 2 HH Sh Mohammed bin Rashid Al Maktoum finished with an average speed of 22.8kmh. At this stage I am not clear whether the thunder and torrential rain slowed down the riders on course significantly, so it is conceivable that he would have completed with an even faster time. But the point I think is made. The fact that it was a championship lead to a winning time slightly faster than would be typical for Non-World Championship race rides over 160km at Euston Park. What’s more, using this approach, presumably most teams would have known what speeds they should have been targeting on each loop to keep in contention. Or alternatively, they would have simply tried to keep up with those setting the pace. So, in conclusion, when it comes to the average speed over 160km for the winner, there are no real surprises. But what about the pattern of the race on a loop by loop basis? Again, this information is freely available and lends itself to analysis to look for patterns based on previous race rides over 160km at Euston Park. What is clear from this analysis, is that the first loop was extremely fast compared with the average for loop 1 for all the winners of 160km race rides at Euston. Actually, whilst I have used the term “average” , I actually used the median, which reduces the influence of loops that were slower or faster than the “norm”. 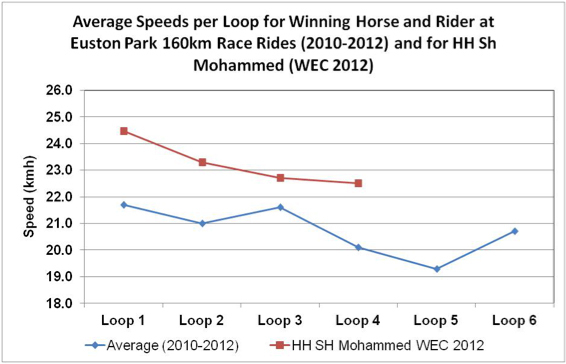 It can also be seen from the graph that winners at Euston typically have a faster 3rd loop than the 2nd loop, but this did not happen for HH Sh Mohammed. This was probably a consequence of the very fast first loop. At the time of writing, the times for the 5th and 6th loops are no available – there was a power loss during the thunderstorms which resulted in a disruption to the timing. (I have to say I’m not sure why given that August is a peak month for thunderstorms that there were not uninterruptable power supplies and surge protectors that would have kept the timing systems up and running in the event of a loss in mains power). As soon as the times for the 5th and 6th loops are posted I’ll finish the analysis. My predictions are that HH Sh Mohammed would have completed the 5th Loop at 21.2 kmh and the final loop at 23 kmh. We shall see!